Maria Schollmeyer, senior nursing and Applied Critical Thought and Inquiry major, has accepted a job with St. Luke’s East Hospital and will be working in the Neonatal Intensive Care Unit (NICU) assisting infants in critical condition. In high school, Schollmeyer did a pre-professional nursing program and shadowed at St. Luke’s East in the NICU unit. Ever since, Schollmeyer knew she wanted to return. “I fell in love with it. I remember going home and telling my mom that I want to work there someday,” said Schollmeyer. Three years later, Schollmeyer is indeed going back and will be doing what she considers her dream job. “I’ve known for a long time that I’ve wanted to work at St. Luke’s, and so it’s really cool to see that dream come into fruition [sic],” said Schollmeyer. Initially, there was not supposed to be a position open at the St. Luke’s East NICU. When Schollmeyer expressed her interest in the NICU – among other critical care floors – during the interview process, she was informed that they were not hiring in that department at that time, but they would give her the opportunity to meet with them anyway. Though there wasn’t supposed to be a position open in the unit, the conversation revolved around the NICU in Scholmeyer’s interview. “The next thing I know they just start talking about NICU stuff which was kind of bizarre since there wasn’t supposed to be an open spot,” said Schollmeyer. Before and during Schollmeyer’s interview, the conversation also turned to her research project about Kangaroo Care, a form of developmental care involving direct contact when a newborn is placed skin-to-skin on a mom or dad, which she did for the William Jewell College nursing symposium. “We were just talking about my project when we were waiting for the interview to start and we talked about it more during my interview. 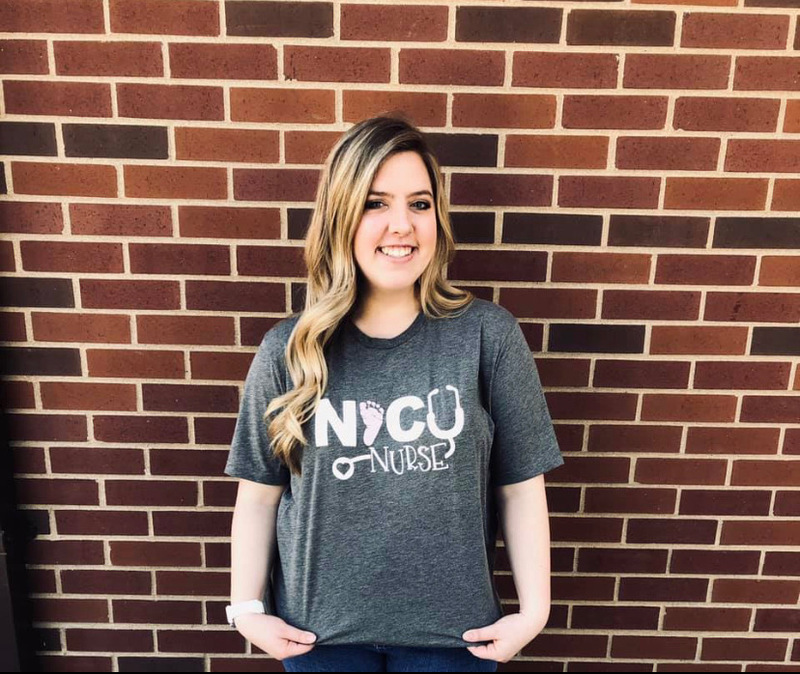 I think it kind of showed how serious and how passionate I was about the NICU and the time and effort I was able to put into it and the opportunity to do a project on it through Jewell’s nursing department,” said Schollmeyer. The morning after her interview, Schollmeyer was offered a position in the NICU department at St. Luke’s East. “I accepted right then and didn’t have to apply anywhere else because I got my dream job,” said Schollmeyer. Schollmeyer gives credit to the Jewell Nursing department and her professors who supported her throughout her time at Jewell and through her application process. In the NICU, Schollmeyer will be taking care of newborn babies who may have some complications or need more care because they were born prematurely. She will get to help deliver babies and assist in that area as well. For Schollmeyer, to be the support for those babies and their parents in those first moments is a privilege. “You know having a baby, in general, is such a vulnerable time for any parent and to find out that you might have a baby that has to stay a little longer or may go off plan – it’s just a really vulnerable time. I really think it is a privilege to have to opportunity to be there for the family and parents in those first few moments of life for those babies and being able to care for them and be their support system and their advocate,” said Schollmeyer. Schollmeyer expressed that she feels well equipped for her future in nursing due to the challenging and immersive nature of Jewell’s nursing program. Jewell’s nursing program allows students to experience all different variations of specialties, unlike some schools where students have to pick and choose. “I’m thankful that Jewell’s nursing department gave us the opportunity to experience everything, we didn’t have to make those tough choices because we literally got to experience everything and really get to make an educated decision about what we are passionate about so I’m thankful for that,” said Schollmeyer. PreviousPrevious post: Quiz: How well do you remember Responsible Self?